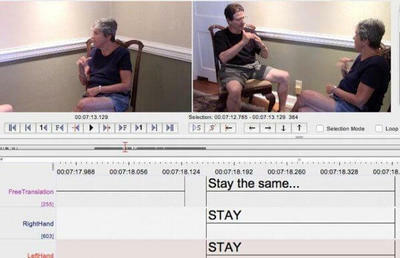 Synopsis : Linguists at The University of Pennsylvania document Philadelphia accent of American Sign Language (ASL). American Sign Language (ASL) is defined as the predominant sign language of deaf communities in the United States and most of Anglophone Canada. ASL is said to have originated in the early 19th century in the American School for the Deaf (ASD) in Hartford, Connecticut. ASL signs have a number of phonemic components, including movement of the face and torso as well as the hands. ASL is a language completely separate and distinct from English. It contains all the fundamental features of language ie.it has its own rules for pronunciation, word order, and complex grammar. Besides North America, dialects of ASL and ASL-based creoles are used in many countries around the world, including much of West Africa and parts of Southeast Asia. British Sign Language (BSL) is a different language from ASL, and Americans who know ASL may not understand BSL. "We want to turn this into a corpus that's publicly accessible," Tamminga said, "to build a web interface so that anyone can go online to see the videos, the stories, the annotation and time-line." She offers as examples linguists working on similar corpora or deaf schoolchildren in Philly interested in learning about their heritage.